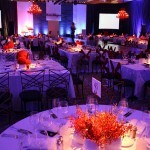 This annual star-studded event is always a highlight to all the generous supporters that believe in this worthy cause. 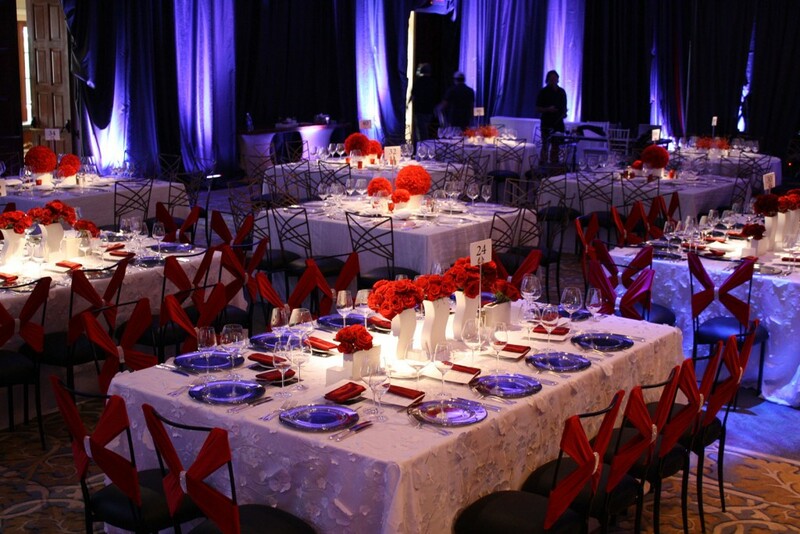 The theme for the event was “A Night of 10,000 Dreams” in celebration of achieving that milestone over the past twelve years. 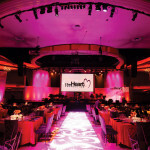 The Foundation prides itself in creating final wishes for the terminally ill and they just achieved their 10,000th dream! 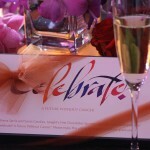 Even though this is a somber and important purpose, we needed the event to be celebratory. 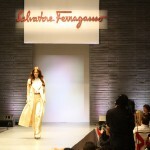 This year the decision was to feature the fashions of Ferragamo with a Fellini-esque entertainment program followed by a program of popular music. 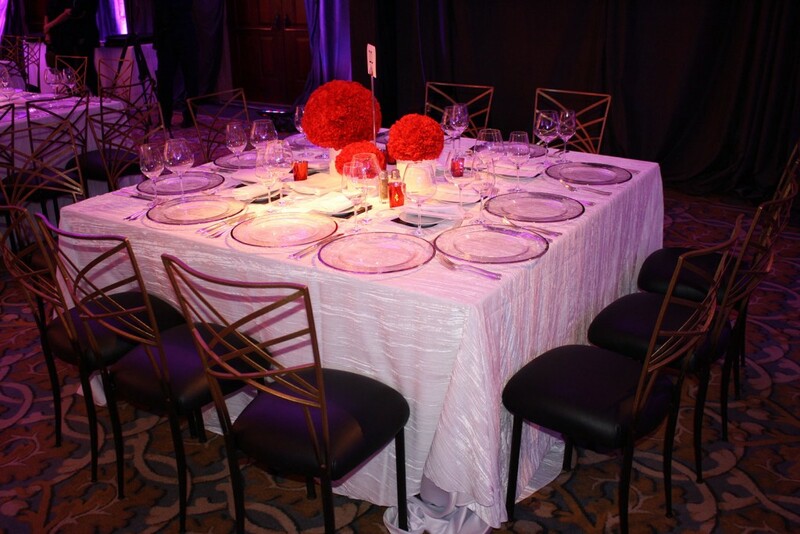 As guests arrived, they were greeted by an experiential entertainment crew of contortionists and overhead acrobatics around the bidding area of the silent auction. 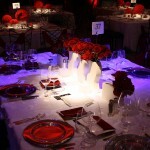 Tables were themed with a slight Cirque look in color and style. 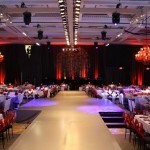 An electric accordion player and character actors guided guests through the process and later into the ballroom. 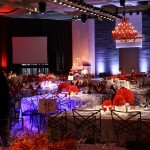 The overall design was a collaboration of thought. 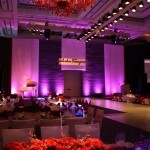 We were showcasing Salvatore Ferragamo and his fashion sense had to be brought through to the room decor. 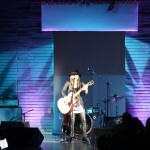 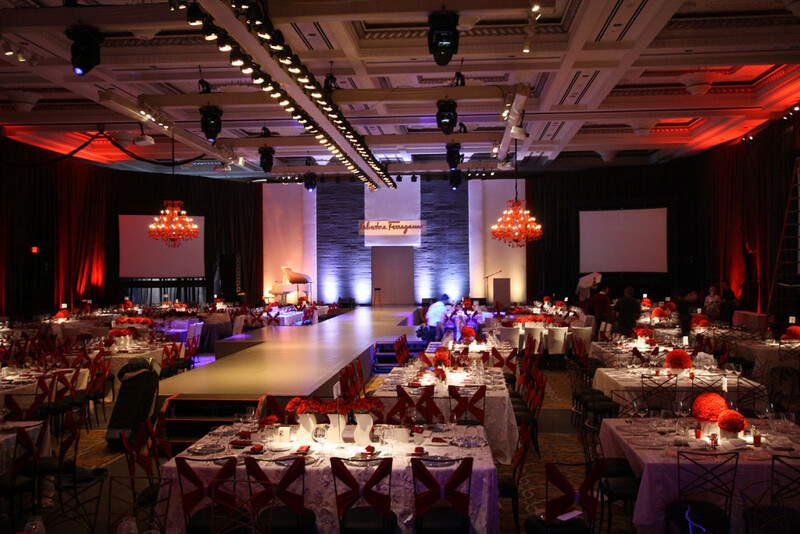 In the world of fashion, you want the clothes to stand out…the plainer the stage and runway the better. 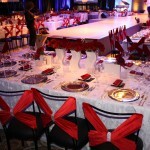 However this was more than a fashion show and that dictated the décor. 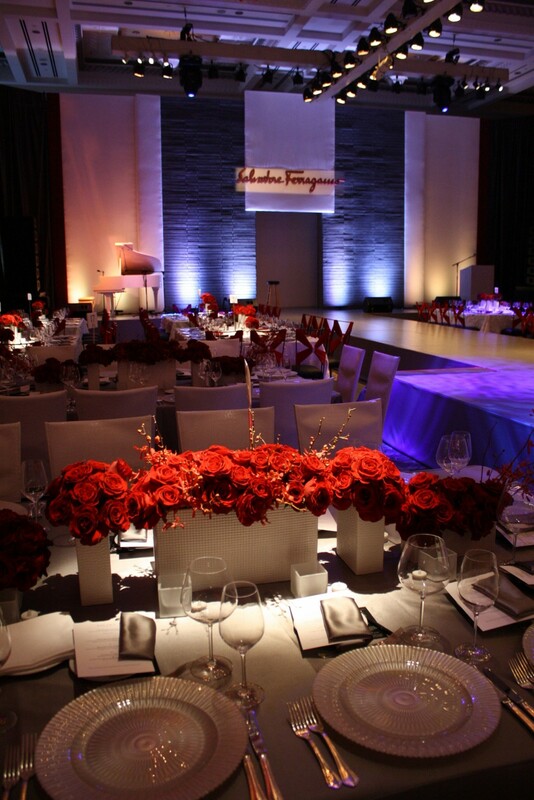 Since the Ferragamo logo is red, that was the reason we chose it as our major pop color. 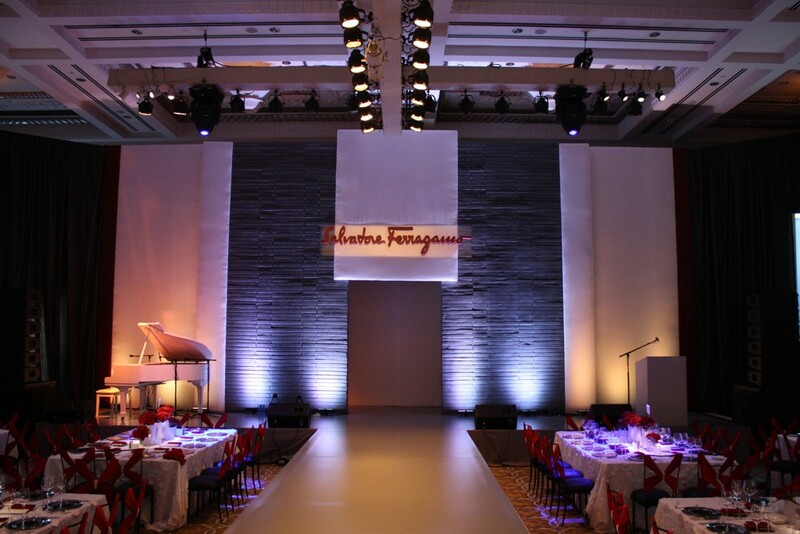 In fact we had a large lucite sign on stage with Ferragamo’s logo in red. 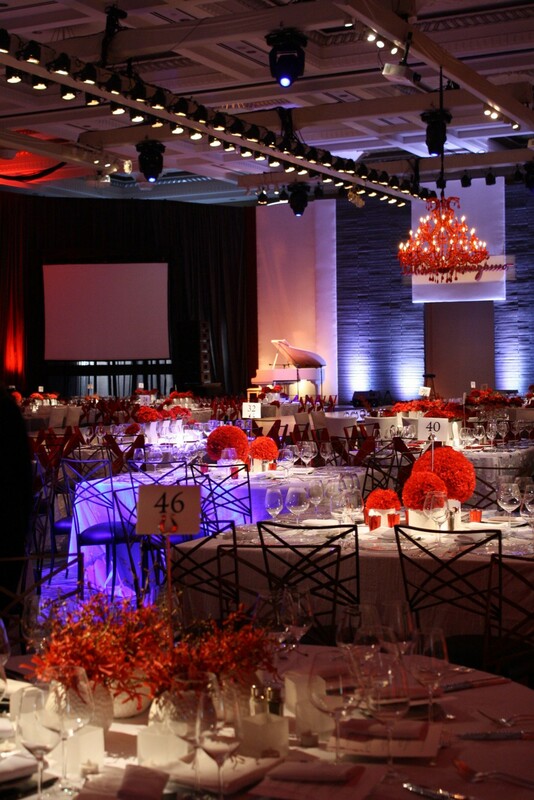 Décor featured a dramatic stage design with a mid-century modern look and true European flair in honor of the famed designer. 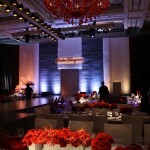 The façade included a faux stone wall circa 1950’s look in an updated design. 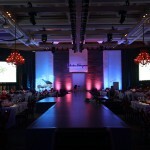 It had a gleaming white runway for the fashion show that changed color throughout the course of the show. 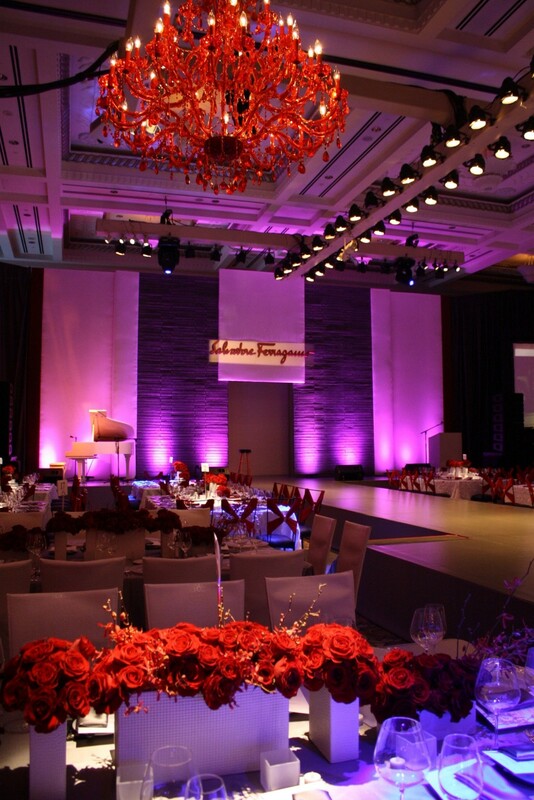 A white baby grand piano was on stage for musical accompaniment. 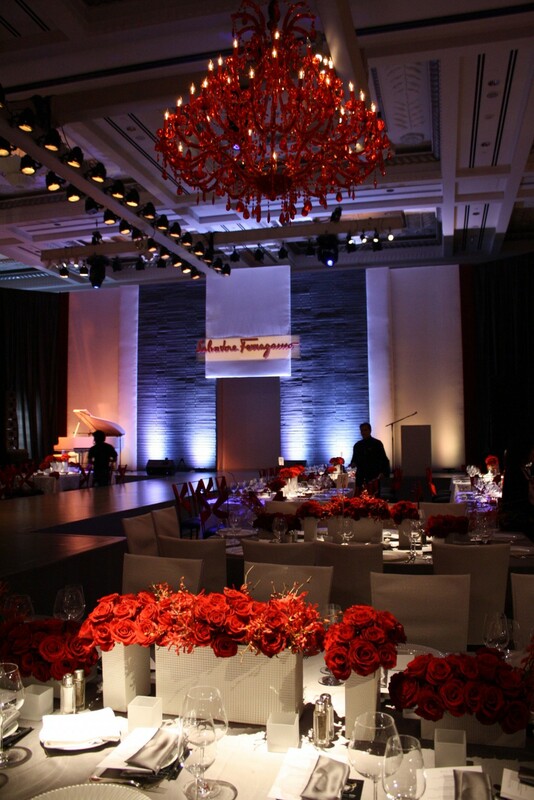 Of course this ballroom had chandeliers, but nothing along the lines that a Ferragamo-branded look required. 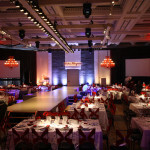 And perhaps the existing chandeliers would have been alright, but lighting is the most powerful way to create an ambience and to convey a look or feeling and we felt that allocating the budget to install two five-foot-wide, seven-foot-tall ornate red chandeliers was well worth it. 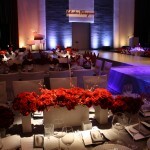 The red chandeliers complemented the red pop color of the room including Ferragamo’s logo, the floral and chair accents. 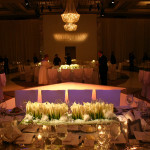 The room was draped floor to ceiling in lush white velvet with dramatic uplights on color changers that matched the mood of the moment. 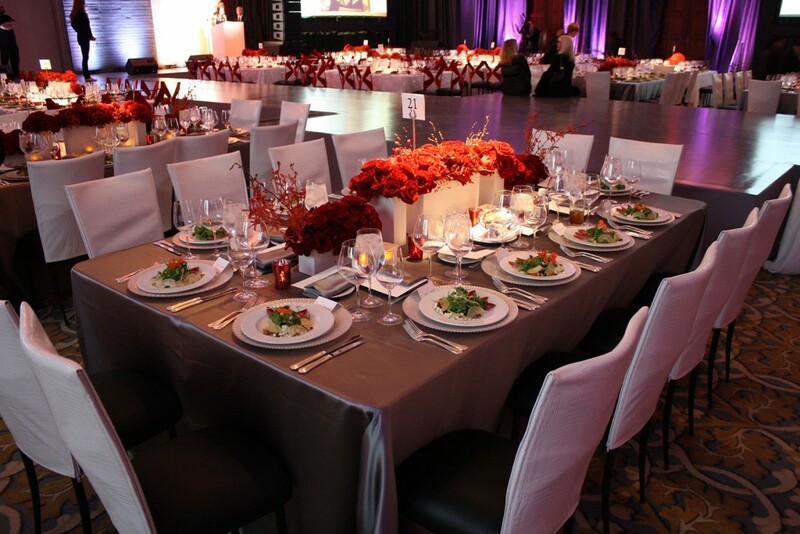 Since this was a fundraiser, each donor table had an assigned value to it. 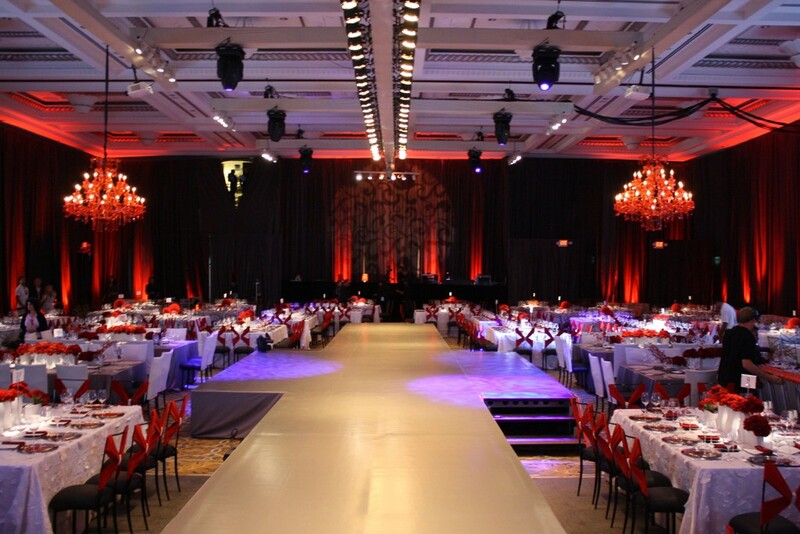 So with four levels, we began with a high-end look and subtly changed the design for each category, keeping them all glamorous. 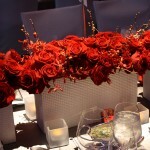 This included chargers, floral, linen and a different style of chair. 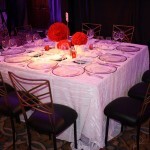 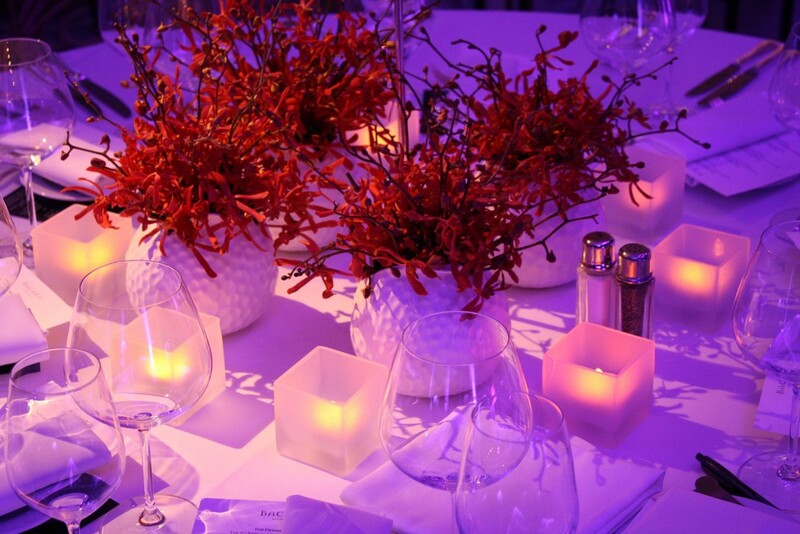 Each tier featured a different coordinated, patterned and textured white linen for each unique table style. 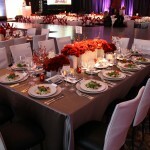 Square tables, rounds and rectangular tables were used. 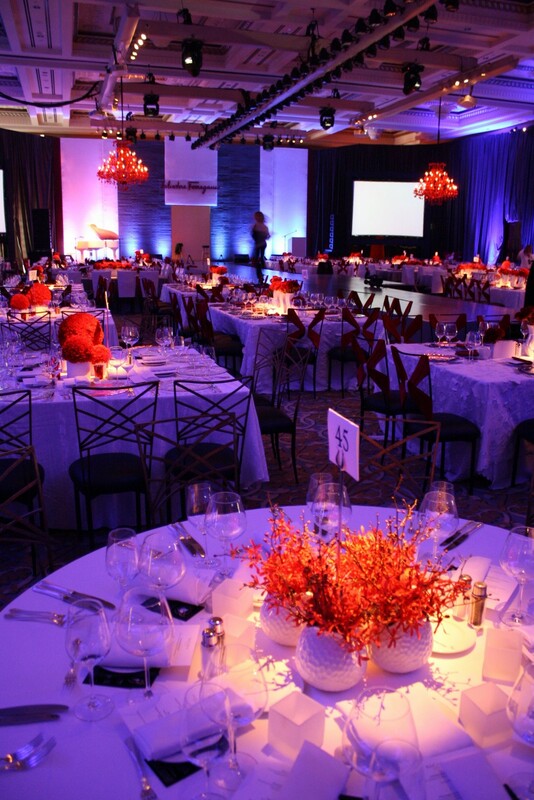 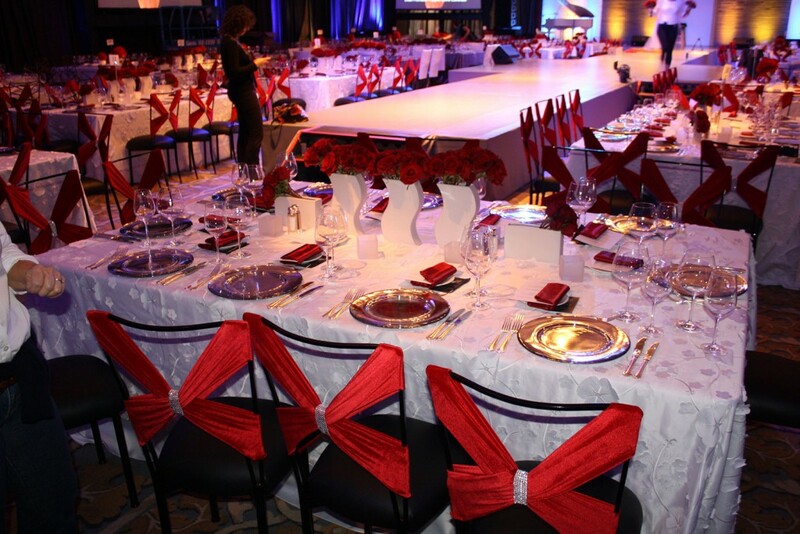 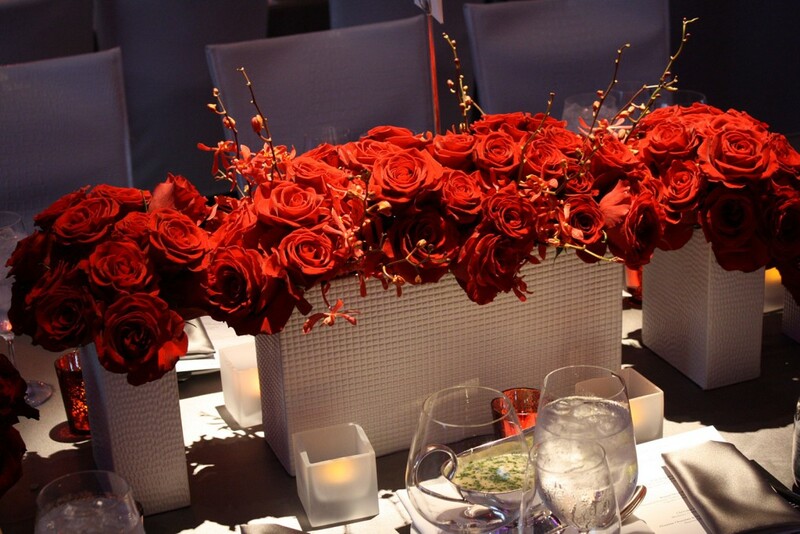 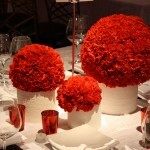 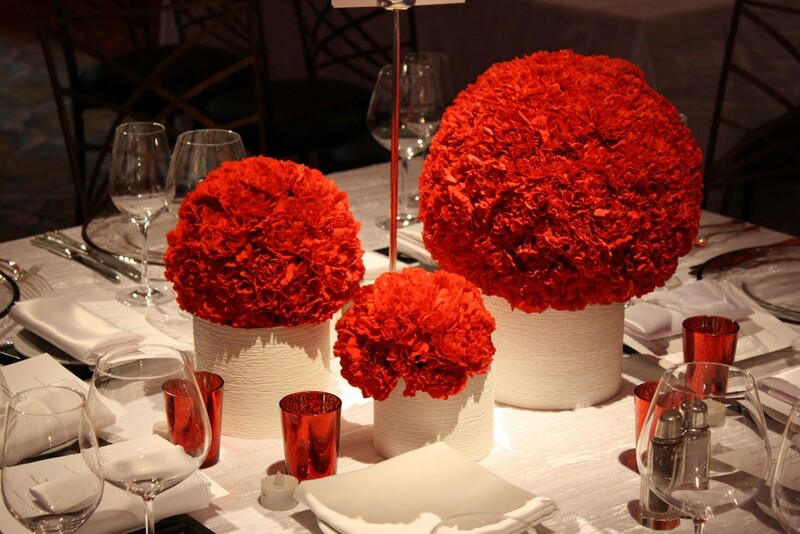 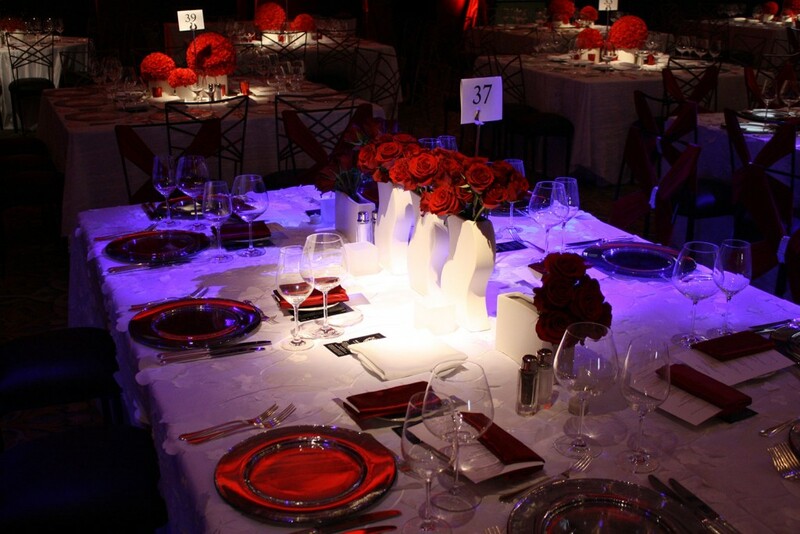 The pop color of red was featured in the dramatic floral, unique to each table shape and price category. 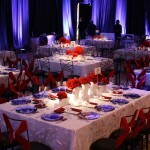 The overall look was outstanding and cohesive! 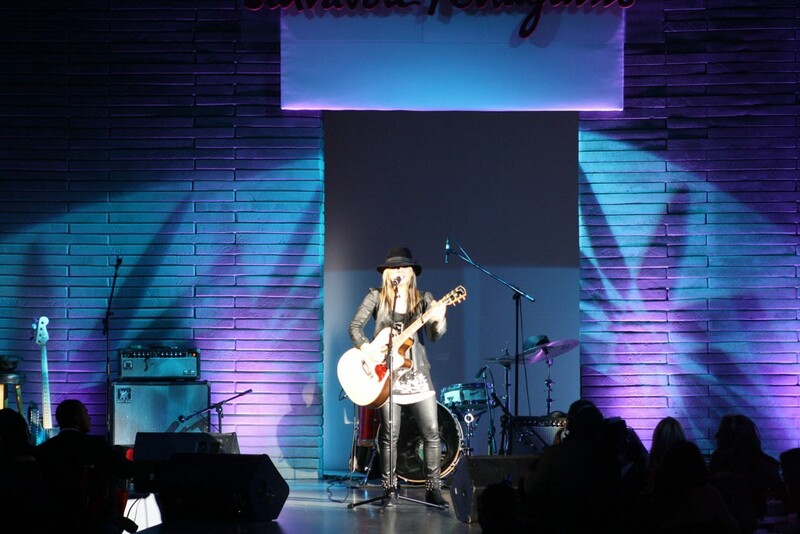 An eclectic mix of entertainment continued with a tango couple from the show “So You Think You Can Dance,” a heart-warming children’s dance troop, David Archeletta and Michael Jackson’s guitarist Orinthe who was premiering her newest music. 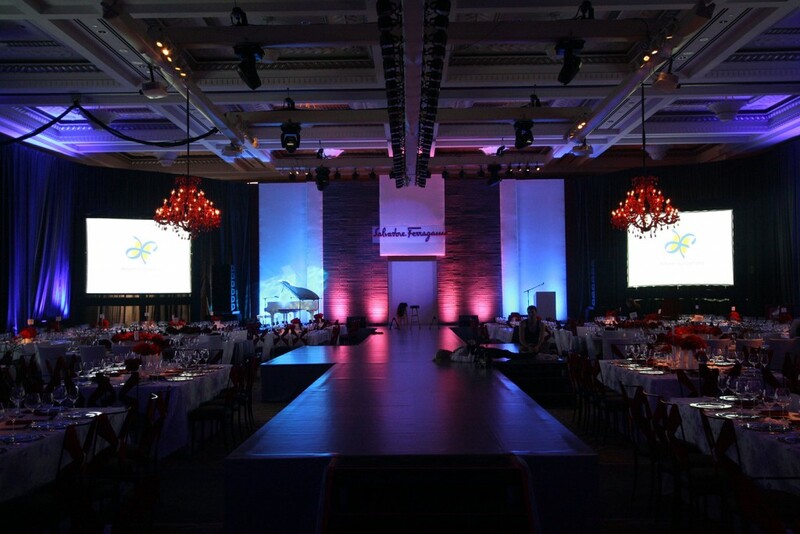 The fashions of Salvatore Ferragamo were featured on the runway to raise money while the guest auctioneer was the always entertaining Dan Ackyrod as the foundation honored Rob and Cheryl Lowe. 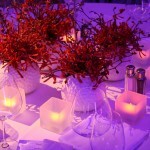 The resort also featured an avant-garde menu to make the evening a seamless experience.